We’d love your help. Let us know what’s wrong with this preview of The Pride of the Hills by Dave Konig. "She's gone. No pulse, no breathing, and cold as an ice cube," I replied while reluctantly withdrawing my hand. Turning around and away from her, my eyes fell on the scene at the end of the basement. Along the wall were roughly a dozen men. All of them had their arms above their heads with their palms pressed against the concrete wall. Their feet were spread apart. Their he "She's gone. No pulse, no breathing, and cold as an ice cube," I replied while reluctantly withdrawing my hand. To ask other readers questions about The Pride of the Hills, please sign up. This book gives a glimpse into the life of a volunteer medic. The author describes his time at the Forest Hills Volunteer Ambulance Corps. Have you ever wondered what it's like to ride around in an ambulance? Here's your chance! The author also describes the motivations people have when joining a volunteer ambulance corps and how they can be disappointed by the reality. It was fascinating to see what type of calls the medics received. The writing was a tad rough around the edges, but it's what I This book gives a glimpse into the life of a volunteer medic. 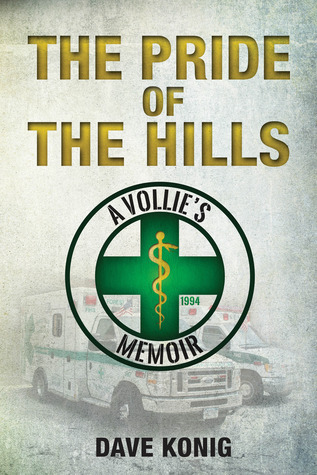 The author describes his time at the Forest Hills Volunteer Ambulance Corps. Have you ever wondered what it's like to ride around in an ambulance? Here's your chance! The author also describes the motivations people have when joining a volunteer ambulance corps and how they can be disappointed by the reality. It was fascinating to see what type of calls the medics received. The writing was a tad rough around the edges, but it's what I would expect from someone trained as a medic and not a writer. The chapters got a bit repetitive at times, but overall it was an interesting read. It reminded me of family get togethers where my EMT relatives swapped their tales. This review has been hidden because it contains spoilers. To view it, click here. I enjoyed this book more than I thought I would. I am not typically a non-fiction reader, but the stories were engaging. The only complaints I really have is that not all the terminology was explained. For example, the chapter about the psych patient had terms ESU and EDP, but I had no idea what they meant and I looked through the book and didn't find it either. I was also left wondering what the fate of the two EMTs were, who didn't want to do their job on Mother's Day. Even a blurb about never I enjoyed this book more than I thought I would. I am not typically a non-fiction reader, but the stories were engaging. The only complaints I really have is that not all the terminology was explained. For example, the chapter about the psych patient had terms ESU and EDP, but I had no idea what they meant and I looked through the book and didn't find it either. I was also left wondering what the fate of the two EMTs were, who didn't want to do their job on Mother's Day. Even a blurb about never seeing them again would have been good. Gripping life of the EMTs. I won this book through Goodreads giveaways.